The head is one of the most common sites of pain in the body. Headache or head pain sometimes can be difficult to describe, but some common symptoms include throbbing, squeezing, constant, unrelenting or intermittent. The location may be in one part of the face or skull, or may be generalized involving the whole head. Headache may arise spontaneously or may be associated with activity or exercise. It may be acute onset or it may be chronic in nature with episodes of increasing severity.Headache is often associated with nausea and vomiting. This is especially true with migraine headaches.Head pain can be classified as being one of three types: 1) primary headache, 2) secondary headache, and 3) cranial neuralgias, facial pain, and other headaches. 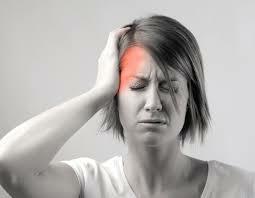 Headache is defined as a pain arising from the head or upper neck of the body. The pain originates from the tissues and structures that surround the skull or the brain because the brain itself has no nerves that give rise to the sensation of pain. The thin layer of tissue that surrounds bones, muscles that encase the skull, sinuses, eyes, and ears, as well as thin tissues that cover the surface of the brain and spinal cord (meninges), arteries, veins, and nerves, all can become inflamed or irritated and cause headache. The pain may be a dull ache, sharp, throbbing, constant, intermittent, mild, or intense. Primary headaches are not related to any other problem and include migraines, tension type headaches and cluster headaches. Secondary headaches are caused by an underlying problem, and can include a post-whiplash headache, neck headache, and drug withdrawal headache. In other words, the headache is a symptom of something else being wrong rather than the cause itself. Treatment for a secondary headache involves treating the source (eg upper neck joints) rather than the headache symptoms. Get in touch with us and let us be your solution!